We often know what really happened, but accept the duty to read between the lines like rookie CIA analysts deciphering Pravda editorials during the Cold War. I don’t expect to ever see a memo like this again. And that’s too bad. CNN is reporting a severance package valued at $378.36 (this is corrected thanks to reader Jonathan’s comment, below). Looks like honesty in severance as well. Last week President Obama announced that the approval process for the Keystone XL pipeline project would be delayed while alternate routes are considered. This project, which would have brought oil from the Canadian tar sands to US markets, had run the regulatory gauntlet, and a few months ago appeared on the brink of a green light. This delay will have the effect of moving the timeline past the 2012 presidential election. I will leave it to others to speculate on the political aspects of this decision; there was clearly a fissure in the Democratic base on Keystone XL (unions wanting jobs vs. environmental groups seemingly against all viable energy development). The sponsor of Keystone XL, Transcanada, has to return to the drawing board and explore alternate routing. Other companies are competing to carry tar sands oil to market, which includes the Far East and China. One point of disclosure: I used to work for a Transcanada subsidiary. I have seen how they work (first class) and I know the kind of people they have designing, building and operating energy facilities (high integrity). When I first saw reports last year of opposition to the Keystone XL project, I thought if anyone could make this happen, they could. One other thing about TransCanada: they take the public review component of projects very seriously and spend millions at-risk to ensure complete project applications, state-of-the-art facility designs, and appropriate citizen input. For the corporate lawyer, however, I see three early lessons that can be drawn from the Keystone XL experience. We are beginning to see more clearly pages from the playbook of citizen activists. The anti-project forces attracted a very press-savvy leader: author and environmentalist Bill McKibben. I also have to disclose that I bought one of his books years ago (“Long Distance”) and actually read half of it. 1. Frame the issue emotionally. From the start, it wasn’t about the merits of the Keystone XL project, it was about saving the earth, that this project would be the final nail in the climate change coffin. Since Keystone XL makes a lot of sense from an energy security and a consumer price stability standpoint, the focus of opponents had to shift. 3. Go to the decision-maker’s house. Two weekends ago, it was like Occupy 1600 (Pennsylvania Avenue) in Washington DC. 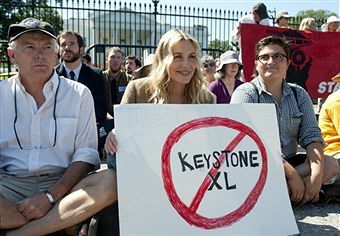 Mr. McKibben and his merry band encircled the White House, reminding those peering out the windows that a crucial part of the Democratic base might stay home in November 2012. Heck, they might even return every weekend until then. So we are starting to see how some activists essentially do an end run on the public comment and review process. They reframe the issues and essentially demonize those who are trying to do good things the right way. While reasonable minds can differ, most who are impartial think Keystone XL was a winner on the merits. That’s how the State Department (which held key permitting authority) saw the project until recently. Threat or promise? You decide. A new page for the playbook, to be sure.